The Temple of Isis is one of great mystery. Many have travelled from lands unknown to simply gain a glance at such a monument. The Egyptians were once looked upon by archeologists and historians as a race that understood what it meant to idolise symbols in a way that was imprinted into their very ideology. Now you can follow them in their pursuit in becoming something far garter than the barriers of reality currently hold you in. 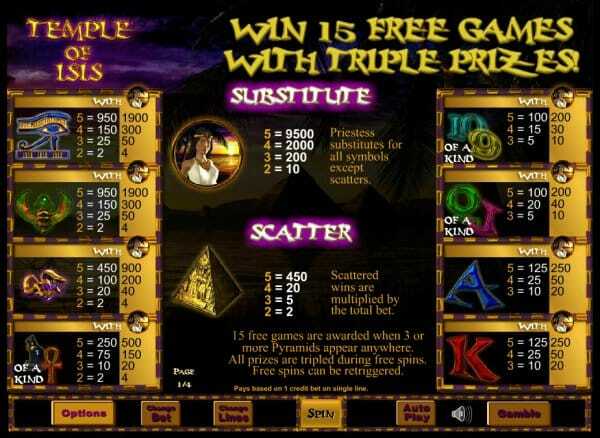 You are the master of your own creations, and in Temple of Isis Jackpot, one is in control of their own destiny. Developed by Eyecon, Temple of Isis Jackpot is unlike the base version of this slot as it possesses a limitless jackpot that is not fixed. This means that the only way to get rid of the jackpot is to win it all. Not many online game devs can hold a candle to the acumen of a company like Eyecon. The quality of games they produce coupled with their overall mentality when it comes to user experiences separate them from the pack. Their games can leave you in a lull of excitement unlike anything ever experienced before, that’s just the kind of company they are. Brisbane Australia’s own signature game developer Eyecon is known not only for its deep rooted passion for creating unforgettable online experiences, but also ways in which to also push themselves forward within an industry that has thousands upon thousands of titles. 5 reels over 25 pay-lines await any player brave enough to challenge the temple itself. 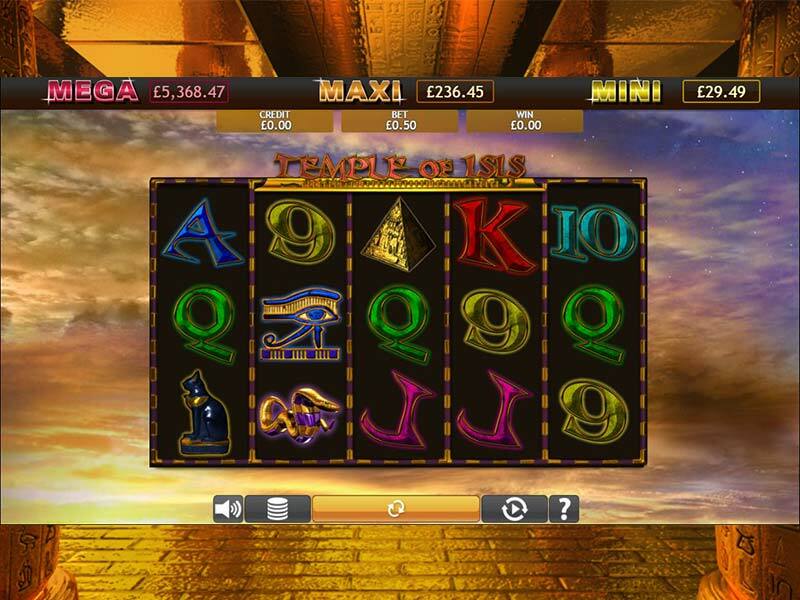 Like many slots in the Eyecon game catalogue, Temple of Isis Jackpot features wilds, scatters and free games among other features that all offer different ways for players to reach even higher in terms of their final scores. The backdrop for this title is one that takes place in the midst of the Sahara desert. One has made the mistake of thinking this slot is a mirage, one that appears when needed most. All the symbols that appear in this slot take the shape of different images you might find in Egyptian mythology. Cats and eyes are a running theme here, with each of these symbols offering a different cash pay-out depending on just how many of these symbols are matched in repeat succession and the number of symbols involved in that winning pay-line. There are lower scoring symbols at play here which take the shape of bog standard low scoring symbols. In order to fully appreciate this title we suggest spinning multiple reels.